Blended with the Diana grape variety. Selected by The Dunstaple Gang. Celebrate the Christmas Season by giving a unique Christmas gift, ideal for the person who has everything. 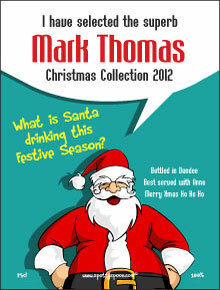 Create a personalised wine bottle gift with a special Christmas message on a fun wine bottle label. Note - good words that convey that Christmas feeling are 'festive', 'yuletide', 'season', 'drunk with friends', 'office parties', 'joy and laughter' etc.